Our Game Improvement Team will custom a lesson program to fit your needs and help improve your game through proven teaching techniques. 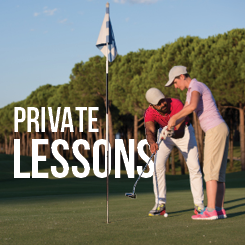 Lessons are held either on our superior outdoor practice facilities or in our 5,000 sq ft facility, which incorporates the latest in golf instruction technology to improve your game. Weather is not an issue at 1757 with covered indoor bays and netting during the winter months, we offer instruction year round at 1757! Our Game Improvement Team is available for individual lessons all year long. Contact our Game Improvement Center at 704.444.0901 ext 6 for more information! Want to learn to play better golf? Learn how to score better? Play a round with a member of our Game Improvement Team and learn how to save strokes and improve your course management. Maximum of 3 golfers in a session and you can play 3, 9 or 18 holes. Fees includes complimentary range balls before and after the round, professional instruction, as well as cart and green fees. Call The Game Improvement Center for Pricing!